"The stupidest program the U.S. government has ever undertaken" – last year that's what I called American efforts to improve the Palestinian Authority (PA) military force. Slightly hyperbolic, yes, but the description fits because those efforts enhance the fighting power of enemies of the United States and its Israeli ally. 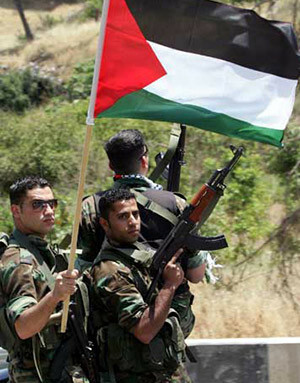 Members of the Palestinian National Security Forces. Shortly after Yasir Arafat died in late 2004, the U.S. government established the Office of the U.S. Security Coordinator to reform, recruit, train, and equip the PA militia (called the National Security Forces or Quwwat al-Amn al-Watani) and make them politically accountable. For nearly all of its existence, the office has been headed by Lt. Gen. Keith Dayton. Since 2007, American taxpayers have funded it to the tune of US$100 million a year. Many agencies of the U.S. government have been involved in the program, including the State Department's Bureau of Diplomatic Security, the Secret Service, and branches of the military. The PA militia has in total about 30,000 troops, of which four battalions comprising 2,100 troops have passed scrutiny for lack of criminal or terrorist ties and undergone 1,400 hours of training at an American facility in Jordan. There they study subjects ranging from small-unit tactics and crime-scene investigations to first aid and human rights law. With Israeli permission, these troops have deployed in areas of Hebron, Jenin, and Nablus. So far, this experiment has gone well, prompting widespread praise. Senator John Kerry (Democrat of Massachusetts) calls the program "extremely encouraging" and Thomas Friedman of the New York Times discerns in the U.S.-trained troops a possible "Palestinian peace partner for Israel" taking shape. No Palestinian state: Dayton proudly calls the U.S.-trained forces "founders of a Palestinian state," a polity he expects to come into existence by 2011. What if – as has happened often before – the Palestinian state does not emerge on schedule? Dayton himself warns of "big risks," presumably meaning that his freshly-minted troops would start directing their firepower against Israel. Palestinian state: The PA has never wavered in its goal of eliminating Israel, as the briefest glance at documentation collected by Palestinian Media Watch makes evident. Should the PA achieve statehood, it will certainly pursue its historic goal – only now equipped with a shiny new American-trained soldiery and arsenal. The PA defeats Hamas: For the same reason, in the unlikely event that the PA prevails over Hamas, its Gaza-based Islamist rival, it will incorporate Hamas troops into its own militia and then order the combined troops to attack Israel. The rival organizations may differ in outlook, methods, and personnel, but they share the overarching goal of eliminating Israel. Hamas defeats the PA: Should the PA succumb to Hamas, it will absorb at least some of "Dayton's men" into its own militia and deploy them in the effort to eliminate the Jewish state. Hamas and PA cooperate: Even as Dayton imagines he is preparing a militia to fight Hamas, the PA leadership participates in Egyptian-sponsored talks with Hamas about power sharing – raising the specter that the U.S. trained forces and Hamas will coordinate attacks on Israel. The law of unintended consequences provides one temporary consolation: As Washington sponsors the PA forces and Tehran sponsors those of Hamas, Palestinian forces are more ideologically riven, perhaps weakening their overall ability to damage Israel. Admittedly, Dayton's men are behaving themselves at present. But whatever the future brings – state, no state, Hamas defeats the PA, the PA defeats Hamas, or the two cooperate – these militiamen will eventually turn their guns against Israel. When that happens, Dayton and the geniuses idealistically building the forces of Israel's enemy will likely shrug and say, "No one could have foreseen this outcome." Not so: Some of us foresee it and are warning against it. More deeply, some of us understand that the 1993 Oslo process did not end the Palestinian leadership's drive to eliminate Israel. The Dayton mission needs to be stopped before it does more harm. Congress should immediately cut all funding for the Office of the U.S. Security Coordinator. Mar. 16, 2010 update: For background on this problem, see Yuval Seinitz's fine 2002 article, "When the Palestinian Army Invades the Heart of Israel" and Howard Linett's 2005 article, "CIA-trained Palestinian snipers?" Mar. 19, 2010 update: For updates on this worrisome topic, see my weblog entry, "Keeping Track of the Dayton Mission."